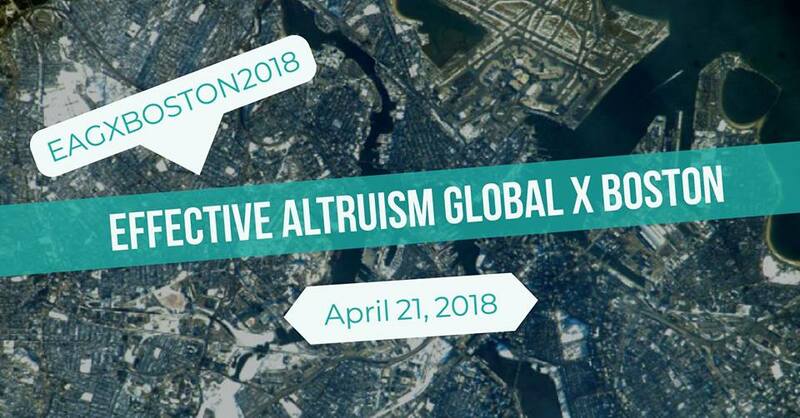 Join us at MIT for EAGx Boston 2018 to hear from prominent speakers, participate in workshops, and witness a collaborative, truth-seeking “anti-debate” on activism against nuclear weapons as a cause area. Goals of the conference include stimulating intellectual progress within effective altruism, promoting communication and collaboration between locality- and university-based EA groups, as well as highlighting a wide variety of impactful career paths. Breakfast and registration will begin at 9:00 a.m. with the first talk starting at 10:00. The conference will end at 6:00 p.m. Breakfast and lunch are included in the ticket price of $25. All food will be vegan. The conference will be held in MIT’s Tang Center, 70 Memorial Dr, Cambridge, MA 02142. From the Kendall T stop, head east along Main St, then turn right on Wadsworth St. The Tang Center is one block ahead at the SW corner of Wadsworth and Amherst. Parking is extremely limited, so we recommend public transport or ride-sharing. The CEO of Whole Foods, John Mackey, and the head of the Good Food Institute, Bruce Friedrich, will argue that eating meat is neither ethical nor healthy. Harvard Debate Members Danny DeBois and Dhruva Bhat will argue the other side. Who will make the better case? You be the judge! Sponsored by Effective Altruism at Harvard (HCEA and HUEA SG), Harvard's Safra Center for Ethics, and The Good Food Institute. You have 80,000 Hours in your career: what will you choose to do with them? This free workshop will help you find a career you’ll be good at, you’ll enjoy, and that will make a big positive impact on the world. The workshop will be led by Peter McIntyre and Dr Brenton Mayer will involve multiple short talks and exercises. By the end you’ll have a plan for your career and a clear idea about the best steps to take. The past: Contrary to the popular impression view that we are living in extraordinarily violent times, rates of violence at all scales have been in decline over the course of history. The present: Human nature comprises faculties that encourage violence, such as dominance and revenge, but also faculties that inhibit it, such as self-control, empathy, and reason. The level of violence in a given society depends on how its norms and institutions affect the balance between them. The future: Professor Pinker speculates on which of the historical changes that reduced violence in the past will continue into the future. You have 80,000 Hours in your career: what will you choose to do? This workshop will help you find a career you’ll be good at, you’ll enjoy, and that will make a big positive impact on the world. It will be led by a member of the 80,000 Hours team and will be a mixture of short talks and exercises. By the end you’ll have a plan and some clear next steps. Harvard University Effective Altruism Student Group and the Future Society at Harvard Kennedy School welcome Dr. Jason Matheny, Executive Director of the Intelligence Advanced Research Projects Activity (IARPA). The event is followed by a conversation with Professor Joseph Nye, and a panel discussion with Professor Jim Waldo and Dr. Michael Sulmeyer. There will also be a Q&A session with the audience. Adriano Mannino is Co-Founder and Chairman of Raising for Effective Giving (REG), a meta-charity that recommends the most effective charities to poker players wishing to make positive impacts on the world through donations of a substantial fraction of their winnings. As a meta-charity, rather than helping people in need directly, REG instead seeks to promote charitable giving and rational, effectiveness-oriented decision-making in general – in order to multiply the impact of effective direct charities. Research in health economics has shown that the direct impact of various charities can differ by a factor of up to 1000. The goal of REG is to promote this idea of effective giving in the poker community and beyond. Adriano will also delve into the rationale behind targeting the poker community - namely, that the rationality skills used for maximizing expected monetary value in poker transfer to the area of maximizing the expected impact of charitable donations. Charlie Bresler, Former President of Men's Warehouse, and current Executive Director of The Life You Can Save, will be giving a talk about his career in the retail industry and what led him towards philanthropy. He'll explain how philanthropy can play an important role in finding meaning in your career. Alan Fenwick is the Founder of Schistosomiasis Control Initiative, which is one of the top-ranked charities by GiveWell, a leading charity evaluator. The organization has delivered over 100M treatments for Neglected Tropical Diseases, and is one of the most highly cost-effective charities in the world. Neglected Tropical Diseases affect over 1 billion people globally, most of whom have little or no access to life-changing treatment. Research and funding directed towards tackling this enormous disease burden is still disproportionately low. Prof. Fenwick will speak about the neglected tropical diseases, their impact on health in the developing world and the steps we take towards their elimination. Why is the nonprofit sector inefficient? What challenges does it face? How can we tell which charities are highly effective and which are mediocre? In this talk, Angela Rastegar Campbell will provide an overview of these issues, and lead a workshop on charity evaluation, a key skill for making smart philanthropic choices. Larry Temkin: Global Poverty—Why should we care? Come hear philosopher and ethicist Larry Temkin's talk that has inspired students at colleges across the northeast! "Each year, millions of children die from readily preventable causes. This raises an obvious and poignant question. What, if anything, should our reaction be to the apparent fact that each one of us could easily prevent the deaths of many innocent people who are not responsible for their unfortunate plight?" Larry Temkin is a professor of philosophy at Rutgers. He holds a Ph.D. from Princeton and is the author of "Rethinking the Good: Moral Ideals and the Nature of Practical Reasoning" (OUP, 2012) and "Inequality" (OUP, 1993). He has received fellowships from the Danforth Foundation, the National Humanities Center, Harvard’s Safra Center for Ethics, All Souls College Oxford, the National Institutes of Health, the Australian National University, and Princeton, where he was the Laurance S. Rockefeller Visiting Professor for Distinguished Teaching. He has received eight major teaching awards, including Rice University’s George R. Brown Prize for Excellence in Teaching, the Nicholas Salgo Distinguished Teacher Award, the Phi Beta Kappa Outstanding Teaching Award, and Rutgers’s Award for Distinguished Contributions to Undergraduate Education. The lecture is open to the public, and will include a Q&A session. Co-sponsored by Tufts Effective Altruism. Come hear updates on GiveWell’s work and ask any questions you may have, both practical and philosophical. Hosted by Harvard College Effective Altruism. Should We Be Making Potential Pandemic Pathogens in the Lab? Novel, contagious, virulent viruses are potential pandemic pathogens in that their accidental or malevolent release into the human population could cause a pandemic. This talk will describe the purported benefits of such studies, arguing that these are overstated; estimate the magnitude of the risk they create, argue for the superiority of alternative scientific approaches on both safety and scientific grounds, and propose an ethical framework in which such experiments should be evaluated. Garry Kasparov: "Winter is Coming—Why Vladimir Putin and the Enemies of the Free World Must Be Stopped"
The ascension of Vladimir Putin—a former lieutenant colonel of the KGB—to the presidency of Russia in 1999 was a strong signal that the country was headed away from democracy. Yet in the intervening years—as America and the world’s other leading powers have continued to appease him—Putin has grown not only into a dictator but an international threat. With his vast resources and nuclear arsenal, Putin is at the center of a worldwide assault on political liberty and the modern world order. Dr. Irene Pepperberg is a researcher at Harvard University in the field of animal cognition, specifically of African Grey parrots. Her work began with Alex, a parrot who was shown to have the emotional age of about a 2 year old child and the intelligence of up to a 5-6 year old child. Her research in areas such as the labelling of objects, shapes, colors, and the understanding of categorical concepts, of bigger-or-smaller, same-different, and nonhuman numerical abilities, revolutionized what the world knew about avian cognition. Arguments for human consciousness usually derive from introspective reports; we lack such reports for nonhumans. Not being able to derive data to posit human-like consciousness, Dr. Pepperberg argues that nonhumans have, at the least, a sense of awareness, which may or may not be distinct from full consciousness. She proposes that this awareness if required for complex tasks and is a form of higher order cognition. Harvard Vegitas and the Humane League: "The Ethics of What We Eat"
“The Ethics of What We Eat"
Join Vegitas as we host a presentation on the ethics of our food choices. We will be exploring the nature of industrialized agriculture and the impact of our food on the animals and environment. Speaker Rachel Atcheson of the Humane League played a critical role in getting Philadelphia City Council to pass its Meatless Monday Resolution and is also working with students at colleges around the US to spread socially responsible diet choices. 80000 Hours: Which Careers Do the Most Good? How to have 1,000 times more social impact with your career. You’ll spend over 80,000 hours of your life working - you should make the most of them. But if you want to do a lot of good, what should you do? Work for non-profits? Try to change government policy? Find a malaria vaccine? Go into finance and give it all away? Rob Wiblin and Roman Duda, researchers at 80,000 Hours, will try to show that by being very strategic you could have 1,000 times more impact than someone who never thinks things through. On my web publication OurWorldInData, I am showing how living conditions around the world are changing. Visualized in graphs and maps, I present the empirical data on global development. In my talk, I will show how the long-run global trends—improving education, improving health, falling poverty, and declining violence—are interlinked and present a long-term perspective on global development. Related to this work I also want to explain why I think it is necessary that we communicate empirical research to the public: You cannot possibly understand how living conditions around the world are changing if you just follow the daily news. You need to zoom out to see how the world is changing. We will be holding office hours this Saturday 10am-4pm in Ticknor Lounge (Boylston Hall) to meet you one-on-one. If you can't make it, please email us at harvardea@gmail.com and we'll arrange a different time. The usual answer is, we’re human. We’re weak-willed, we’re lazy, we’re selfish. There are also some reasons specific to giving money to charities—poverty (or disease, or injustice) seems intractable, so giving feels futile, aid money is often wasted, and sometimes harms the countries it’s trying to help, and so on. All this is true. But it’s not the whole story. The answer has also to do with a deep suspicion of morally minded people that has developed over the past couple of hundred years, and this talk will sketch a history of that suspicion. Larissa MacFarquhar has been a staff writer at The New Yorker since 1998. Her subjects have included John Ashbery and Edward Albee, among many others. Before joining the magazine, she was a senior editor at Lingua Franca and an advisory editor at The Paris Review. She is working on a book about extremely ethical lives. Oxford and Harvard philosopher Derek Parfit is described by Encyclopaedia Britannica as "the most important moral philosopher of the 20th and early 21st centuries”. The New Yorker called his books "the most important works to be written in the field in more than a century." He will be discussing personal identity, future generations, ethics and Effective Altruism in a fireside chat moderated by ethicist Nir Eyal, Associate Professor of Global Health and Population at the Harvard T.H. Chan School of Public Health. This event is co-sponsored by Harvard University Effective Altruism (HUEA) and Harvard College Effective Altruism (HCEA), and is open to the public. Derek Parfit (BA, MA, Oxford) specializes in ethics and philosophy of mind. He is a Senior Research Fellow of All Souls Oxford and a Fellow of the British Academy and the American Academy of Arts and Sciences. He is the author of Reasons and Persons (Oxford, 1984), and the recipient of the 2014 Rolf Schock Prize. He is currently a visiting professor at Harvard. 80,000 Hours Career Coaching Competition! There are 80,000 hours in your lifetime career. Do you wonder how you can make the largest impact with your life’s work? Enter the 80,000 Hours Career Coaching Competition for a unique opportunity to receive personalized, evidence-based advice on figuring out career paths for high-impact. Based on 80,000 Hours’ world-leading research, this competitive coaching process will address next steps and career options with the goal of maximizing your positive social impact on the world. Finalists will receive personalized feedback on their career goals, and the grand winners will receive intensive coaching from 80,000 Hours via Skype conferences. To round out Effective Altruism Week, we will have a screening of Dr. Strangelove, a 1964 political black comedy film that satirizes the cold war fears of a nuclear conflict between the USSR and the US. The film will be prefaced by Professor "Mad" Max Tegmark, MIT physicist and founder of the Future of Life Institute. Professor Tegmark will be speaking about both the potential and existential risks of powerful technologies. Co-author of "Why Nations Fail: The Origins of Power, Prosperity and Poverty"
Professor Acemoglu will discuss why it has been difficult throughout history to build state capacity, and why the development of the notion of generalized rights has been instrumental in the emergence of states that have the capacity to deliver services, but are constrained in their ability to dominate society. Daron Acemoglu is the Killian Professor of Economics at MIT. In 2005 he received the John Bates Clark Medal awarded to economists under forty judged to have made the most significant contribution to economic thought and knowledge. But… do you also want to make a difference outside your career for altruistic causes you care about, be it global health, animal rights or existential risks? Come to the career panel on earning-to-give—an international movement of people who donate money and efficiently allocate it to maximize their positive impact in the world. Effective altruism is built upon the simple but profound idea that living a fully ethical life involves doing the "most good you can do." Such a life requires an unsentimental view of charitable giving: to be a worthy recipient of our support, an organization must be able to demonstrate that it will do more good with our money or our time than other options open to us. Singer shows how restructuring one’s life to live altruistically often leads to greater personal fulfillment than living for oneself. This event is part of Harvard Effective Altruism Week! Peter Singer is often described as the world’s most influential living philosopher. His 40 books have appeared in more than 25 languages. Singer is the Ira W. DeCamp Professor of Bioethics, Princeton University, and Laureate Professor, School of Historical and Philosophical Studies, University of Melbourne. Singer is also the founder of The Life You Can Save, an effective altruism group that encourages people to donate money to the most effective charities working today. GiveWell's Elie Hassenfeld: Measuring "Good"
—How and why did GiveWell start? —What are GiveWell's and the Open Philanthropy Project's plans for the future? Where do they hope to be in 1 year? 5 years? —What is GiveWell's role within the Effective Altruism movement as a whole? —What are GiveWell and the Open Philanthropy Project currently working on? Effective altruism is a new movement focused on the deceptively simple idea that we should try to do as much good as we can, as effectively as we can. This event is open to the public. Come hear updates on GiveWell’s work and ask any questions you may have, both practical and philosophical. Prof. Max Tegmark will explore how we humans have repeatedly underestimated not only the size of our cosmos (and hence our future opportunities), but also the power of our humans minds to understand it and develop technologies with the power to enrich or extinguish humanity. He is an MIT physics professor with more than two hundred technical papers and has featured in dozens of science documentaries. His work with the SDSS collaboration on galaxy clustering shared the first prize in Science magazine’s “Breakthrough of the Year: 2003.” He is also the president of the Future of Life Institute, which is launching a major research program supported by Elon Musk aimed at keeping artificial intelligence beneficial.